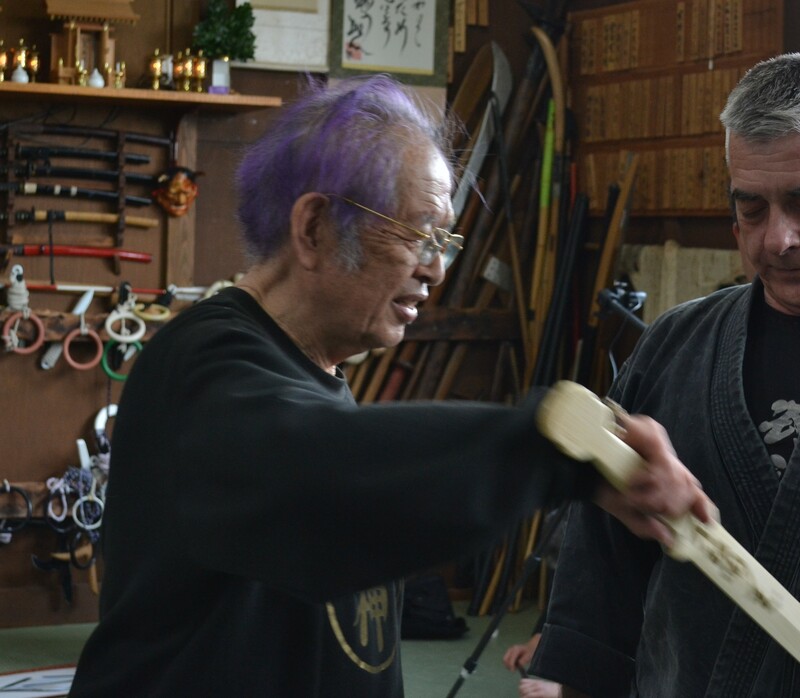 Yesterday’s class in Ayase was amazing, Sensei was in a very good mood and was smiling the whole time from ear to ear. Sensei did so many variations that I have to admit that I had a hard time remembering anything. But I will try here to explain some of the few technical points I remember. But as I was largely unable to do the technique demonstrated yesterday please do not see this post as a 伝承, denshô (transmission). See it merely as a message brought to you by a 伝書鳩, denshobato (carrier pigeon). Sensei was alternating taijutsu and Ken jutsu and was demonstrating one signle principle: how to use kûkan. as we know since 2003 and the beginning of the Juppô Sesshô cycle of study, Kûkan (space) lies between uke and tori and also around them both and the body movements carried by the legs create the opportunities of action. Luckily he said a few times that it was correct not to remember anything. Watching around me I was happy to see that I was not the only one totally lost and obeying to his advice. By not using any strength (力じゃない, Chikara janai, no physical strength) we do not create the body counter reactions generated usually in uke’s body. Therefore we are virtaully invisible and free to move towards the opponent because he cannot figure out where the next attack will be coming from. Uke doesn’t perceive your movements as being a danger for him. When you move softly like that, uke creates the tensions and destroys himself into the kûkan. Kûkan is not empty there is a density to it. Sensei asked us to use it in order to defeat the opponent. By extending and shrinking the space like a 水母, kurage (jellyfish), uke is lost and his reactions are always out of tempo. Sensei’s movementswe always coming from 体, Tai (body). He said that we should not use the legs nor the arms but the body only. When uke thinks the danger is coming from the legs, the arms are taking his balance and conversely. In other words, you are “jin” at all times and when uke reacts to “ten” he is defeated by “chi”; and when uke reacts to “chi” he is defeated by “ten”. You don’t anything. As the Tao te king puts it: “don’t do anything and nothing will be left undone”. By not showing intention but creating the illusion of movement, uke is fighting against himself. Last night it seemed that uke was being suicidal. The 肘 hiji (elbows) were playing a big part in this mind trapping of uke. The arms, at the elbow level, were either stuck to the body or fully overextended. Sometimes at the same time, sometimes one extended one stuck. Sensei was using his spine and shoulder to redirect uke’s body during the attack. When moving sensei looked like he was boneless and his moves were all soft and non aggressive, nearly feminine. Sometimes he looked like someone who had lost his mind. The 攫むじゃない, Tsukamu janai (don’t grab) also played a large part. Sensei’s hands were often open and grabbing not possible. The action was carried out by the body, the arms, the legs, the hips, the spine. When you don’t grab uke, you don’t inform him on your intention, not being able to guess your next move, he is lost in the kûkan and whatever he does is wrong and out of rhythm. Action on the 指, Yubi (finger) with the fingers or the hand was paramount during the whole class. Sensei was not holding uke but inevitably uke’s fingers were trapped in sensei’s palm, softly but firmly. immediately all your reactions. Sensei rolled my eyeball softly through the eyelid protecting the eyeball, there was no pain at all and no danger for the eye but somehow your brain orders the body not to move. The only option is to wait, hoping you still have two eyes at the end. We did a lot of kaeshi waza where sensei was attacking and using uke’s blocks or grabs, as a starting points for countering. One important point he explained was to immediately open and stretch the fingers after being intercepted by uke. Extending the fingers changes the 梃, teko (lever) and creates a natural off balancing. Also when receiving the attack, or countering the blocking, sensei used a few times some strange kind of hira ichimonji no kamae, expanding and/or decreasing the space. Once again the image of the kurage comes to mind. He also demonstrated 陰陽, Inyô (playing hard and soft): Often when in contact with uke, what was hard became soft and conversely. These alternative tensions in sensei’s body sent wrong imformation to the body of uke who, by overreacting was losing his balance and the control he thought he had over sensei. I was sensei’s uke and had the chance to feel and experience it, it was really strange as if your body is drunk. Suddenly you find yourself only supported by nothingness. He added that it was like juggling with uke. By alternating hardness and softness your body and mind are trapped. But the worse is coming now! All these points we covered above were done altogether at all time! No wonder why we felt lost during this class. And he used the exact same techniques with the Ken. Only distance changed but these points were applied seamlessly with the Ken. He referred many times to his movement as being “Mutô Dori”, even when both uke and tori had the sword in hand! That was 無刀執り, mutô dori in the sense that he was “juggling” the sword around without hitting uke at all. The sword held in many different ways (kata yubi, ryô yubi, ôya yubi, etc) was simply landing softly on uke’s body creating from uke’s behalf a useless counter reaction. Then with simple walking motions sensei would end up putting one edge of the blade on the open spots of uke’s body. Let me insist again: all the points detailed above were applied also with the Ken. At one point he slammed down uke’s weapon with the flat side of the Ken held in Ôya yubi and added the second hand to increase the force of the control. Shiraishi who was uke lost his weapon repeatedly. The slapping movement was swift, not violent but powerful. Sensei also spoke of 実戦の空間, Jissen no kûkan to summarize the movements of the class. This way of real fighting is based on the density of empty space. By using what he called 気の流れ, Ki no nagare, the flow of energy (i.e. kurage) you trap uke in a dimension beyond his level of perception. Time doesn’t exist anymore and your space is definitely not uke’s space. Having no time nor space to refer to, uke explodes by himself and offers his body to be slaughtered. Maybe I got it wrong and when Spoke spoke of 無刀執り, mutô dori I should have understood 無人執り, mu to dori, no one is grabbed. I hope that some of these explanations will help you to understand that yesterday night was really like being caught into the twilight zone. But the most surprising was to see Sensei’s permanent large smile. and Gustavo Sanchez (Mexico) received the Shingitai diploma.